In many places, many incredible things are waiting to be not only known but discovered. It is incredible what can be discovered by looking where it appears to be nothing. Everywhere you can imagine, incredible things are waiting to be discovered. Observe nearby you and it's tremendous how much of our days are dependent on new research and science. We’ve all felt the disappointment when our mobile phone battery is dropped or we have a problem of low bandwidth while surfing the web or power cut. We are having a huge deficiency of new ideas, new inventors, new motivators, and people who really craving ventures. We have also arranged things so that almost no one understands science and technology. This is a prescription for disaster. We might get away with it for a while, but sooner or later this combustible mixture of ignorance and power is going to blow up in our faces. If we began counting there are also incredible kinds of stuff which are already discovered and we are not aware of that science yet. There are also tons of sound and light frequencies out there we can pick up on without limited senses. As we progress we will continue to discover newer technologies that will alter what can be discovered more and more as time goes on. Everywhere you can imagine, incredible things are waiting to be discovered. Seize the day. Make difference Stay motivated. 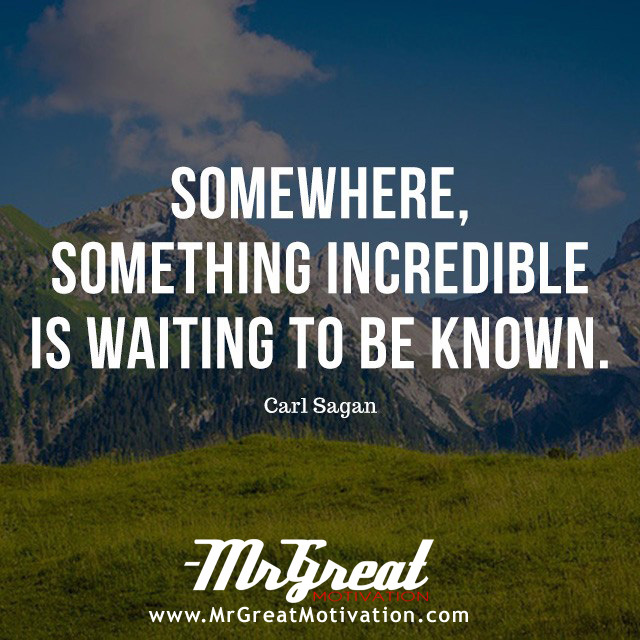 We hope guys you find Quote "Somewhere, something incredible is waiting to be known - Carl Sagan" by Mr Great Motivations useful. If you think we have made some efforts, then don't forgot to appreciate us by sharing this Quote with your friends and family, And thanks for visiting.